The aim of technology transfer is to build a bridge to link the scientific-academic field with the production process. Santiago Villa and Mariana Berenstein. Photo: CONICET Photography. 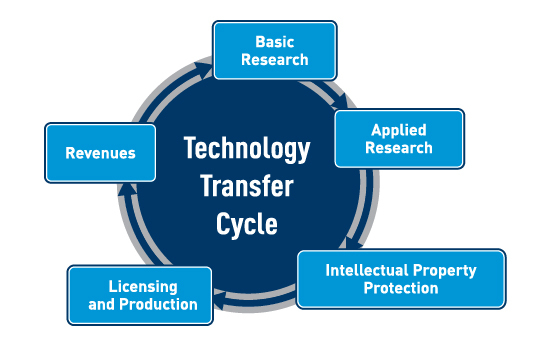 Technology Transfer involves taking investigations from the laboratory to companies and institutions, transforming research into products that solve specific problems. Some examples include: vaccines, specific antibodies, new therapeutic drugs, improved crops, cosmetics and nanomaterials for domestic and industrial purposes, plus developments in terms of alternative energies. All these investigations began in the National Scientific and Technical Research Council (CONICET). Through its Technology Transfer process, this agency transforms research into available products in the market. The role of technology transfer is to build a bridge to link the scientific-academic area -that studies basic and applied processes- with the productive sector in charge of manufacturing or developing the products resulting from those investigations. Companies, state institutions, research organizations or even laboratories could comprise this productive venture. 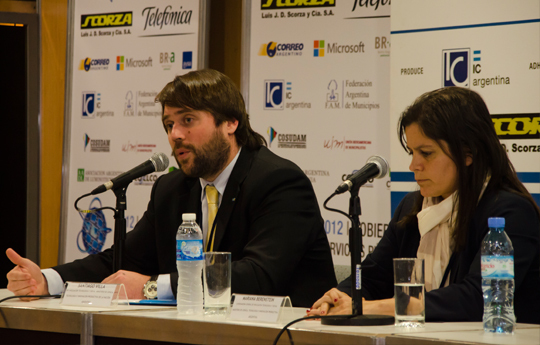 “Our aim is that all work and knowledge generated by CONICET investigators reach people in the shape of products that cover not only their needs but also the markets’”, explains Santiago Villa, Technology Transfer Office (TTO) Director of the institution. With 14 offices all over Argentina, the TTO is the effective nexus between scientific research and its commercial or industrial development. In Villa’s view, the role of TTO is to foster the nexus between the investigator and the productive sector: “From showing and offering what we have to defining the best way to reach the market”, he adds. Mariana Berenstein, TTO Coordinator, explains: “The investigators contact us through our web site or through one of our offices and we evaluate the possibility of patenting that development. From that moment on begins an initial analysis that could take about 30 to 45 days.” On average, the patent granting estimated time could vary between 4 to 8 years without preventing the fact that some technologies may be negotiated or commercialized before that period of time. Once the form is submitted, the investigator can present the results in specialized magazines in order to disseminate the finding to the scientific community. “With CONICET intellectual property polices, the investigator has rights over the eventual commercialisation that could generate the patent in the future,” Berenstein concludes. In 2010, through the TTO, 135 agreements were signed, 30 per cent more than in 2011, for a total of $116.000.000. The accords comprise Public-Private Partnership Agreements of technical assistance, licensing, cooperation and partnership agreements, among others. Between 2010 and 2012 the incomes regarding High-Level Technologic Services (STAN) and accords increased 190 per cent. STAN comprise activities such as papers, analyses, advisory and consultancy services, among others. In most cases, their presentation requires different equipments, infrastructure and specialized human resources from different centers, institutes and laboratories that depend on CONICET or are related to it. In 2012, 623 SMEs were provided with assistance including STAN, consultancies or services to third parties, to name a few. Technology Transfer allowed the development of new products. For instance, a new insecticide for agricultural industry was developed: the company Biagro S.A. got the license on a patent that protects a biopesticide that does not produce hazardous waste. Compared to synthetic pesticide, this product reduces the possibilities of raising resistance. This product was developed jointly by CONICET, the National University of Tucumán and the Agro-industrial Experimental Station Obispo Colombres in Tucumán, Argentina. In turn, the Institute for Drug Chemistry and Metabolism (IQUIMEFA, CONICET-UBA) developed an everyday lotion that reduces hair loss, enhances its growth from its roots and controls dandruff definitely. From the laboratory, the investigation was oriented to find pharmacological activities in different plants such as the coffea and larrea. The pharmacological effects of these plants’ samples and hair loss symptoms were linked. The resulting innovations were called “Composition with antifungal activity” and “Topical composition for hair growth” and they were licensed for ten years to Garré Guevary S.R.L. laboratory. One year later, the lotion was developed and its commercial name was Eco Hair, now commercialized in the national market. Finally, a group of CONICET investigators of the Agrobiotechnology Institute of the Litoral (IAL, CONICET-UNL) managed to isolate and characterize a specific sunflower gen that is related to the natural response of the plant under antibiotic stress, such as drought and salinity. On this basis, CONICET and the National University of the Litoral partnered with the company Bioceres in order to patent and commercialize the finding. Versioning by Cintia B. Gonzalez.